We women are PASSIONATE about finding a good pair of jeans! We’d be willing to do just about anything (legal, of course!) to find them and make them ours. When we find a pair of jeans that fits, we will hang onto them no matter what – even if the button is broken and the knees are saggy. There is nothing like a contest to get y’all to let me know you are around! (And I’m THRILLED by that! I’ll run a contest every week if I have to, to get your attention) — unfortunately, I haven’t found the secret to getting companies to notice me and request me run giveaways. I wish I could send you all a pair of jeans. How cool would that be? (And how popular would I be??!!) But I had to pull out the Random Picker (know in these parts as my son) to pull the names out of the bowl. Lala said… I will tweet it, I will blog it and bingo, I subscribed. I’d like to win because I just had a baby and there’s nothing more frustrating that buying new jeans. Make it easy, send me some…..please. topsytechie said…Love your new blog profile pic. You are rocking the cute cut! I’ll tell you why I need these jeans, if you promise not to tell anyone else…the jeans in my closet right now are all ELASTIC WAIST!!! Yes, those ones that 4 year-old boys insist on? Those are the kind I have!! But I hate uncomfortable jeans…so if these are miraculously comfortable but still look good, then sign me up! Mommy Cracked said… I need these because I’m sitting here in my mom jeans that have a missing button on the closure. Halp! carol ~ i throw like a girl said… I twittered, too!! Have a great day! Toss Those Mom Jeans to the Curb! We all know to stay away from Mom Jeans: the jeans that are anything but flattering around the tummy [or anywhere else, for that matter]. And we know to be careful with low-riders that potentially show off our backsides if we do something so unusual as, you know: sit. What are we to do if we want casual comfort without resorting to sweatpants? It’s not easy finding jeans that are comfortable, stylish and properly cover your badonkadonk. But the Lee Custom Fit Comfort Bootcut jeans meet all of that criteria. Every inch of these jeans make them the perfect jeans for any size and shape body: Great stretch fabric, new premium finish, Comfort Waistband [which moves with you], sit just below the waist, flap back pockets, bootcut. And a large size range: Ladies, Petite and Womens. And guess what? You have the opportunity to win a pair of these great jeans: I am giving away TEN pairs. 1) Simply leave a comment here telling me why you would love a new pair of jeans. 2) You can enter a second time by posting about the contest. Leave your post link in a separate comment. 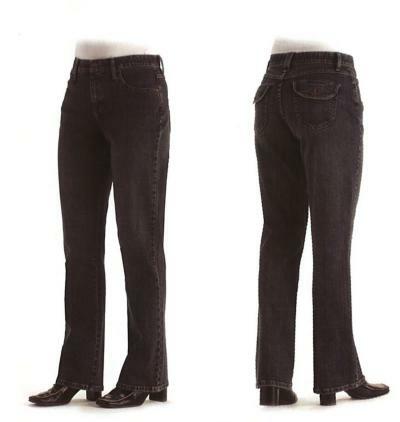 Now you have 4 entries to win the Lee Comfort Bootcut jeans. The contest will end Sunday, December 7th, at 11 PM [CST]. I will announce the winners on Monday morning. Good luck to you all! Head over to Martha Stewart’s blog for a chance to have your blog reviewed by her and her fabulous group of inspiring women. Head over and leave a comment on the post with your name and blog address, make sure to add a link on your blog to mine (you must do this to be reviewed!) and she will pick several of YOUR blogs to be featured on The Martha Blog! Karen of Simply Amusing Blog and Simply Amusing Designs and I have teamed up to offer two lucky readers a very special prize. Do you know a deserving blogger who desperately needs a blog makeover? Perhaps it’s you? Blog your most compelling story as to why you think this person deserves a blog makeover and then send us your link. We’ll choose 10 semi-finalists and let you have the deciding votes for the two finalists on Blissfully Domestic! The Extreme Blog Makeover team could be coming to your blog soon! :: Blog your most moving story about why you or someone you know deserves a blog makeover and link up at Blissfully Domestic on Wednesday, July 30th by midnight EST. :: If it’s not your blog, please provide links to the blog to be made-over somewhere in your entry. :: We will choose 10 finalists and post the links to their stories here. :: Reader voting will begin August 1st and end Monday, August 4th. :: The two blogs that have received the most reader votes will be declared the winners – so make your stories good! :: The winning blogs will enter each designer’s queue and depending on the size of their queue, may have to wait up to 4 weeks, but hey! It’s a gift from us to you! ::You can check out our work at Fruition Designs and Simply Amusing Designs! Grab our button and help spread the word! You may have been a winner… but I’m a LOU-WHO-WHO-WHO-SER! Over 3 years ago a month ago I took part in the Blogging Giveaways Carnival. I even heard back from one of the winners. And then a bunch of life crap stuff happened and that email [along with the one I sent to notify the winners] got pushed further down into my inbox until, I fear, it must be lost to the light of day forever. Every search of my inbox results in nothing. Big fat nothing. Every search of my blog for clues = big fat nothing. And I have no way of knowing who to contact for those giveaways to follow-up with them on their prizes! So attention World Wide Web: If any of you were notified that you won my giveaways, please email me [lookingtowardsheaven [at] gmail [dot] com. And please accept my apologies. I am usually so on top of things, but the past month and a half has apparently gotten the better of me!